So finally you’ve decided that you are going to try waxing the wood furniture in your home. What should you get, and where do you get it. When it comes to paste wax there are not that many choices available in a retail setting like your local big box store. I have personally only seen one brand of paste wax in a big box store and there may be nothing wrong with it but I have never used it myself. Your best bet to score the best brands of paste wax are at a specialty wood working store like Wood Craft or Rockler. Any one of these retailers should carry everything you need and help you pick the product that’s right for you. If you don’t have any retailers in your area there is always amazon. There are three types of furniture wax that you will be most likely to use and should cover any and all of the applications that you would likely use them for. I will even plug the brand that I would use, keep in mind that I am endorsing these products on my own. Let’s begin with the wax that you are most likely to use in your home. It is a clear paste wax and has a high gloss sheen when applied. Keep in mind that you want your wax finish to match the finish that it’s protecting. When you look at the piece of furniture if it has a high sheen finish (high gloss) like many dining room tables and hutches pick a clear paste wax. 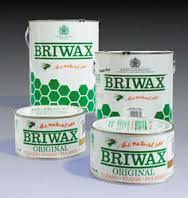 Briwax is a British product that has been around for a long time and has a shorter drying time than many other products. They also make other wood care products that you might like so check them out on the web and feel free to comment below if you have any success with any of them. Satin waxes are used to wax furniture with a satin finish. It’s a finish that has a dull sheen, or does not have a mirror effect when you look at it. I like to use Watco satin wax, it is a bit different in that it comes in a liquid so you need to be a little more careful when applying it indoors. You don’t want to spill it on your rug or carpet…..or anywhere really. When picking a maid service make sure they not only know how to clean your house but also how to take care of the items that make it your home.